When it comes to her style, Tracee Ellis Ross is in her own style lane which is one of the reasons that I like her. She was on hand for the 75th Golden Globe Awards at The Beverly Hilton this evening(January 7th) in Beverly Hills, CA. 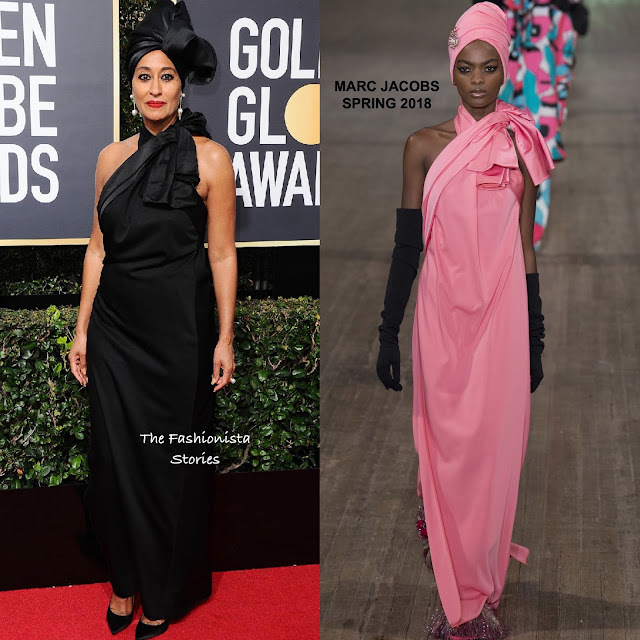 She hit the red carpet wearing a MARC JACOBS SPRING 2018 black head wrap and black floor grazing halter dress with a detailed tie neck. While I am totally loving the fit of the dress, the look suits her style and she sells it. A touch of color came via her red lip which topped off her look along with IRENE NEUWIRTH jewelry and black pumps. What do you think of Tracee's look?